They said they were investigating HSBC Private Bank (Suisse) and "persons unknown for suspected aggravated money laundering". HSBC said it was "co-operating with the Swiss authorities." 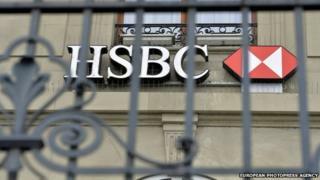 The raid comes more than a week after allegations first emerged that HSBC's Swiss private bank may have helped wealthy clients evade tax. The chief executive of HSBC's Swiss private bank, Franco Morra, said last week it had shut down accounts from clients who "did not meet our high standards". Mr Morra added the revelations about "historical business practices" were a reminder that the old business model of Swiss private banking was no longer acceptable. Last week, HSBC admitted that it was "accountable for past control failures", but said it had now "fundamentally changed". HSBC said it was "co-operating with relevant authorities". Geneva's attorney general, Olivier Jornot, told reporters the investigation could be extended to individuals suspected of money laundering or tax fraud. "The goal of this investigation is precisely to verify if the information that has been made public are well-founded and if de facto reproaches can be made, whether it be towards the bank, or towards physical persons, like collaborators or clients," he said. But Treasury sources said George Osborne had given several interviews in the last few days on the matter, and that there was nothing new in Labour's letter.